Lefties may not be all that common in the real world, so much so that in times past people were forced to learn how to write right-handed because being a lefty was a sign of the devil at work. Today it’s estimated that about 10% of the general population is left-handed. But in baseball, the percentage is significantly higher. For position players, it’s about 16% or 1 player in 6. For pitchers, fully a third or 33.3% are lefties. Let’s investigate further and eventually make the best choices for left handed baseball gloves. On defense, there are some positions which are well-suited for left-handed players. There are the pitchers, of course. They offer a markedly different angle of approach for hitters to deal with, and left-handed hitters now also have to learn how to handle a pitch that seems to go straight towards them. Then there are the first basemen, whom managers and coaches would prefer to be left-handed. That’s because their catching hand is on the right and that’s pointing towards the inside of the infield. It makes it easier to step on the base and catch the ball, as there’s no awkward turning of the body as there would be if the catching hand is the right. Finally, you have the outfielders who can be either right- or left-handed and it won’t really affect play. For all these positions, you can easily find left handed baseball gloves. They’re not quite as rare as you may think. This is especially true of you do your shopping online, and not in some small-town sporting goods store in Middle America where there’s a main road and not much else. Some people who are new to baseball can be a bit confused about how it’s called a left handed baseball glove when it is placed on the right hand of the player. This is simple enough to explain. A left handed glove is for a left-handed player. A player like this throws with his left hand, because throwing with the right hand is pretty much an exercise in futility. If you’re right-handed, try throwing with your left and you’ll see just how stupid it looks. And since the throwing hand is on the left for lefties, the catching hand is the right, and that’s where the gloves are worn. Gloves protect the hand when you catch a baseball, as they can be very painful to catch when they travel at high speed. In fact, some catchers still need to ice their catching hand afterwards after a session with a fastball pitcher. Gloves also help you field the ball as well. There are many factors to consider when you buy a glove, whether it is for right- or left-handed players. The elements to consider include the feel and comfort it provides, its suppleness, its ability to help you catch and control a ball, the speed in which it allows to grab the ball and throw, and of course its durability as it will be tested by a lot of baseball catches. But some types of gloves for certain positions will need special features. The first baseman is of course also an infielder. But next to the catcher, he’s the player who catches the baseball the most often. He’s the one the other players throw to as the hitter tries to make it to first base. They throw to him when it’s a fly ball and the runner on first tries to go to second as the hitter makes contact. And the pitcher or the catcher may throw to him to keep the runner on first from stealing second base. 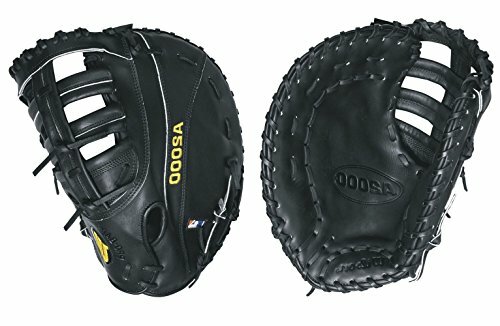 So with all that catching going on, naturally the left handed first baseman glove must also be made primarily for catching. This is why the gloves for first base are a bit larger than other infielder gloves. Also, often the gloves feature some sort of webbing so that the first baseman can still see the path of the ball while he positions the glove in front of his face. One excellent example of a first baseman’s glove is the Wilson A2000 Series 12″ first base mitt. Its pocket is specifically designed to keep the ball in its place when you catch the throw to you. It comes with dualwelting that pre-curves your fingers to crate the perfect pocket for catching. Your hand doesn’t sweat because of the super-breathable Drilex lining in the wrist. Its fabled durability is due to the use of professional stock leather. Technically, the pitcher can be considered part of the infield. But they don’t usually field balls, except for the rare line drives that seem to go directly to their face or the infrequent bunts that a pitcher can reach ahead of the catcher or the infielder. But the most important function of the pitcher’s glove is to hide the ball from the hitter, so that the hitter doesn’t know how the pitcher is grasping the ball. Knowing how the pitcher is grasping the ball can telegraph the kind of pitch coming. And that means the baseball glove for pitchers can’t have that webbing—it has to fully cover the baseball. 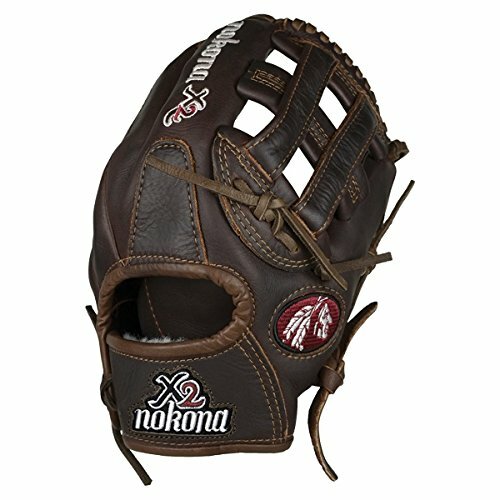 If you want the best left handed pitching glove then consider the Nokona above. There are two important functions for a left handed outfielders glove. One feature you need is that it should help you catch fly balls. At the same time, it should also enable you to get to the ball quickly for a speedy throw. Runners can advance once an outfielder makes the catch, and a quick transfer can prevent a fly ball from becoming a sac fly. There are several notable examples of gloves which are ideal for outfielders. One is the Rawlings Heart of the Hide Dual Core 12.75-inch Outfield left handed throw baseball glove. On its Amazon page, all the reviews gave it the highest five-star rating. 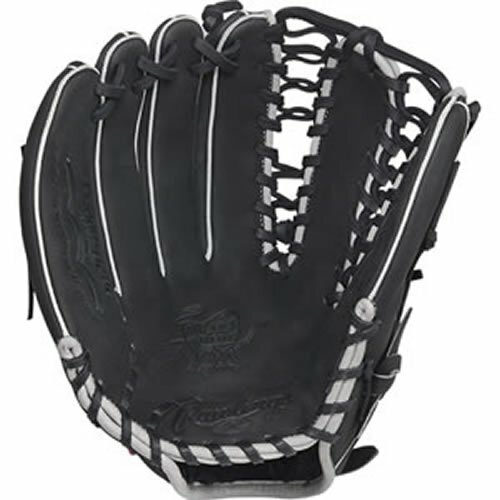 It’s easy to break in, it works well for outfielders, and it is very durable. These are for players who play multiple positions. 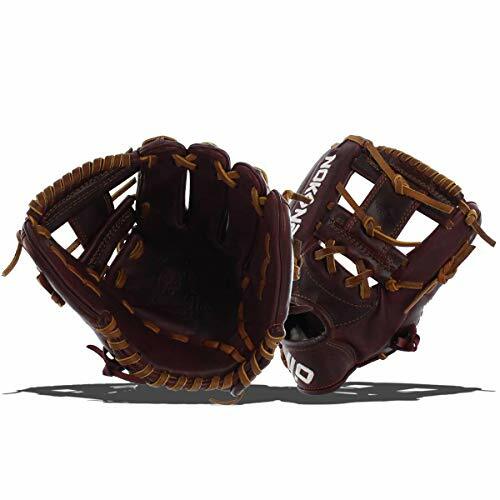 You can try the Nokona Bloodline Pro Series baseball glove: P4 for this, since it has received 7 “almost” five-star rating reviews. Infielders and outfielders love it. It’s made with the highest quality leather and has a huge two year warranty! Remember, Nokona gloves are made right here in the USA. This glove is ready to go right out of the box. Some gloves just don’t come anywhere close to the quality of this one. Despite all the pictures showing right handed gloves, these are all for lefties. As you can see, if you are left-handed you can access superior equipment easily enough. If you screw up with these gloves, you don’t need better gloves—you need more practice! Snag one of these awesome left handed baseball gloves today and start breaking it in by next week. You have a lot of great tips here for choosing the right glove for your left-handed player. My daughter’s best friend is a left-handed pitcher who also plays first base. She has a pretty versatile glove. @Lesley – It was tough growing up as a lefty because physical stores only had so many left handed gloves. Thanks to the internet I can order basically any model I wish to have and have it shipped in two days thanks to Amazon.